Gorillas are the largest of the apes. Conservation Status: Gorillas species are dwindling due to the loss of habitat, human encroachment, poaching and due to pervasive diseases like ebola. 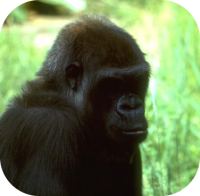 Size: Male gorillas measure 5.5 feet when standing upright, and weigh 300-450 lbs. 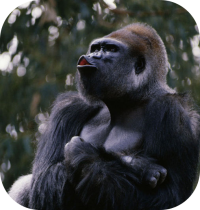 Female gorillas measure approximately 4.5 feet when upright and weigh around 200 lbs. 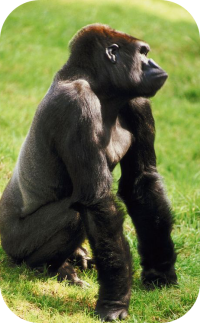 Adult male gorillas also known as silverbacks, are almost twice the size of the adult female gorillas. Species: There are four species of gorilla. Habitat: Gorillas live in Africa. 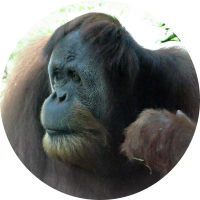 They are found in lowland tropical rain forests and in the higher rain forests, mountain slopes, and bamboo forests. Gestation: Gorillas carry their young for 8.3 to 9 months. Birth: Gorillas give birth to young that weigh 4 to 5 lbs at birth. The gorilla infants are helpless, they begin to crawl around 2 months of age, and they walk around 8 - 9 months. The young nurse for up to 3 years. 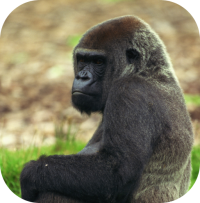 Behavior: Gorillas are most active in the morning and late afternoon. 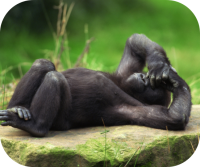 Gorillas over the age of 3 make nests, for resting and night nests for sleeping. Diet: Gorillas are herbivores. 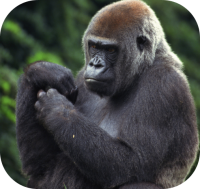 Gorillas eat leaves, shoots, roots, vines and fruits. 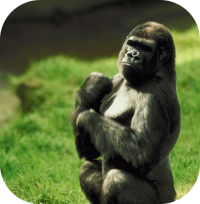 Description: Gorillas have dark skin and black to brown-grey hair. Males become silverish gray on their backs and thighs when they reach sexual maturity earning them the name "silverback". 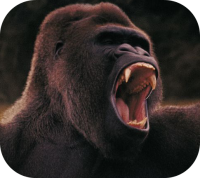 Communication: A gorillas communication is very overt it can involve beating their chests, cupped hands to make a loud noise, scream, baring their teeth, and charging. Gorillas are very hairy, except for their faces, palms, and soles of their feet. Social Structure: Gorillas are social, they live in groups called troops. Troops consist of one adult male and multiple adult females and with their offspring. Gorillas will groom each other as part of their social habits. Life Span: The life span of a gorilla in the wild is 30 to 40 years. A gorilla's life span in captivity is approximately 50 years. Unusual: Gorillas are very intelligent and can learn extremely complex tasks, for example some gorillas have learned some sign-language to communicate with humans.